Easily one of the finest films I've seen at Hot Docs this year, Bhutto takes a close look not only at the life and legacy of Benazir Bhutto, but at her whole controversial family and the history of Pakistan. Directors Jessica Hernández and Johnny O’Hara provide a thorough and detailed overview of Benazir's upbringing under her father Prime Minister Zulfikar Ali Bhutto, her education abroad at Harvard and Oxford, her rivalry with her brother, and her groundbreaking reign as the first woman elected to lead a Muslim state. There is epic scale about the whole dense and compelling story. The Bhuttos are comparable in many ways to the Kennedys. Zulfikar met John F. Kennedy in 1963, and when Kennedy remarked "too bad you are not American, because if you were, I would have appointed you to my cabinet." Zulfikar Bhutto famously retorted, "President Kennedy, that is very kind of you, but if I was American, I would not be in your cabinet but would be president of the United States!" 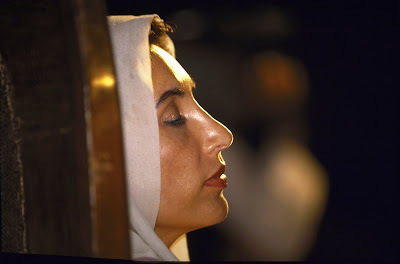 Benazir herself comes across as heroic and highly intelligent, as well as tragic. We get to hear many personal and moving revelations in her own words. She inspired massive throngs with her leadership, but also had many detractors. Her friends and family provide interviews that help put her life in proper context. We also get to see how the meddling of the U.S. created more problems than it solved, and how they supported the backed the dictators General Zia ul-Huq and Pervez Musharraf, as well as Osama bin Laden. The film covers a lot of ground, and could easily have been made into a mini-series. They pack a lot into the 115 minute running time. The pace is brisk, almost breathless. My only complaint was that the wall-to-wall throbbing music was tiresome and occasionally made things hard to understand. Nonetheless, Bhutto is a powerful film that will stay with you long after the film is over.